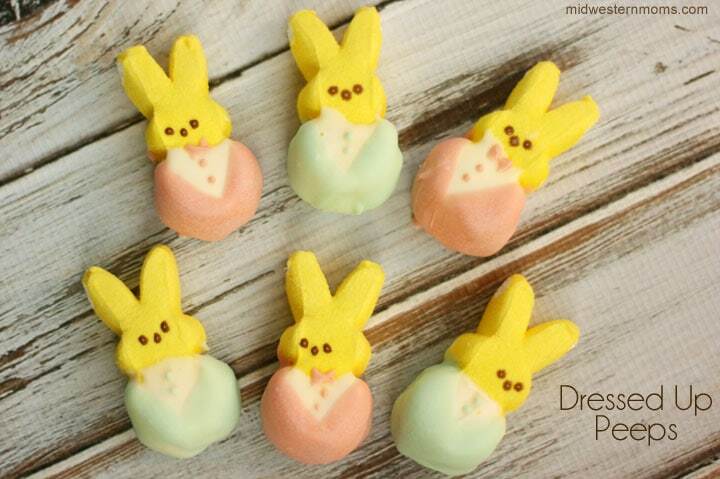 Who doesn’t go out and get some Peeps as soon as the Easter candy is out? Peeps are a staple in our house. This year, I decided they need to get dressed up. These Peeps are ready to go to their Easter celebrations. They have their spring suits and some even have bow ties. Or, they could be the Easter Bunny getting ready to hide all the eggs for the egg hunt. These really were quite simple to make. Only Peeps and a few colors of candy melts are needed. If you want to change it up, you could give the bunnies a Tux with melted chocolate. Use the White Candy Melts for the shirts and use the same technique to make the tux. 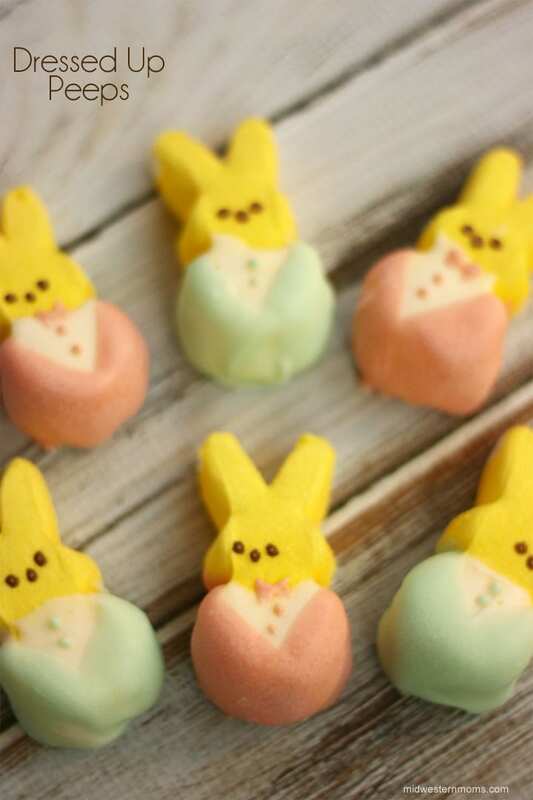 Follow these instructions to put Peeps in a little tux! Peeps dressed up in the Sunday Best! Perfect for Easter Treats! Melt some of the white candy melts according to the package. 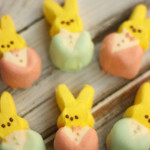 Dip the body of the Peeps up to the neck in the white candy melts to create the shirt. Allow to dry before moving on. Melt your suit color candy melts according to the package. Dip the body of the Peeps to create a “V” in the front so it appears to be a suit jacket. With the left over colored candy melt, place it in a zip lock bag and cut a very small hole in one corner. Use this to add the buttons and a bow tie to the shirts. Allow to dry before enjoying. Cute! Harper doesn’t believe in eating Peeps because she thinks they’re cute. I would love to do this if she felt differently!! What a super cute & yummy idea!! Too cute to eat! 🙂 I’m not a huge fan of Peeps unless I’m blowing them up in the microwave, but my kids are of course! Haha Thanks for the fun idea! I love your ideas! So cute and easy. Super Cute! I love!! Hope you stop by and visit My 2 Favorite Things on Thursday – Link Party too!! It’s still open…I’d love to have you!! Hi there! Stopping by from Worthwhile Wednesdays. This is so adorable. I love the ones with bowties! This recipe looks absolutely delicious. Can’t wait to try it and see if it is a hit with my boys. Stopping by from the Monday Madness Link Party! This is just the cutest thing ever! Thanks for sharing with the Tips & Tricks Link Party. Pinned!